Eels of Larike Village in Ambon, Indonesia | Anguilla sp. Toward the end of my stay in Ambon, I visited Larike village, which is about an hour away from Maluku Divers by car. I went to check out the resident eels. On previous visits, I had seen and photographed the eels of another village called Wai (I posted some of the photos here), but this was my first visit to Larike. It just so happens that Hafes, one of the friendly team at Maluku Divers, is the Raja of Larike...literally, the King of the village. As a result, getting information about the eels and arranging a visit was a relatively straightforward proposition (or, as straightforward as things can be on an island). I made two trips to the village, the first of which was late one afternoon to check out the layout of the area, as well as the temperament of the eels. On that initial visit, one of my top priorities was to determine how friendly the eels exactly were. There's friendly...and then there's really friendly. I was hoping for the latter, in order to get compelling footage. Hafes was my guinea pig, as you can see in the picture below. I asked him to stand in the river while the eels slithered up to check out his feet. I didn't realise it at the time, but Hafes wasn't completely certain that the eels wouldn't devour his toes, so hats off to him for keeping his cool (well, almost doing so if you discount the muffled shrieks of panic). While I had my head dipped into the water with a couple dozen eels around my head, Hafes took a few snapshots, no doubt relieved that it was me, not him, this time who was face-to-face with the horde of serpentine creatures. Me at work with eels. Andy looking dorky and getting in my way. Note: Andy, the dude not brave enough to stick his face in the water, is the owner of Maluku Divers. He fancies himself an artist, but it was a struggle just getting him to hold one of my lights correctly. The things I have to put up with. Like other eels of this genus, these elongated fish are catadromous. They begin life at sea in a mass spawning session. As larvae, they're known as leptocephali. They develop into a form called glass eels, and then elvers when they become pigmented. They then return to rivers to mature, and eventually go back to sea to spawn. Actually, there's a lot we don't know about these types of eels (no surprise, eh? ), but one thing is for certain. Global populations of Anguillid eels have declined precipitously in recent years (again, no surprise, right?). Some of the decrease is probably due to overfishing/ overconsumption (think: unagi), but habitat destruction no doubt plays a role too. One thing that attracted me to Larike is that the village is just metres away from the ocean. The eels can come and go as they please, so in a sense, it's a refuge for these animals. In many "advanced" countries, rivers have been dried up, dammed up, silted up or otherwise stuffed up by our collective short-sightedness. Eels can't complain and don't attract cute-cute, hug-hug attention for NGO fund-raising campaigns, so most people don't know about them. "Save the Eel!" just doesn't make the grade as a marketing slogan. If you'd like to learn more about eels, I can recommend: Eels: An Exploration, from New Zealand to the Sargasso, of the World's Most Mysterious Fish, which I just finished reading not too long ago. It's not the most succinct of titles, but it's a fascinating book about a subject that you might not otherwise have occasion to learn much about. 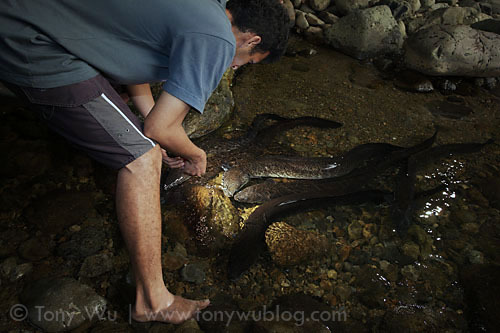 When you visit Ambon, it's worth take a little time at the end of your stay to drop by Larike and see the eels. The river is a center of activity for the village, so there are usually people about. The eels are totally accustomed to people wandering around, so it's not difficult to see them. Take a towel, some drinking water, bug repellent and a mask/ snorkel if you want to stick your head in the water. Notice that the girls are actually working. The boys are...well...doing important boy stuff like posing for the camera.